Artists have a gift. With a single stroke of the brush, they can tell an entire story. They can make someone laugh or cry just by putting their pen to paper. Their music can bring joy or sadness. So why do we celebrate when someone says they want to be a doctor or a lawyer, but feel sorry for them if they say they want to be an artist? 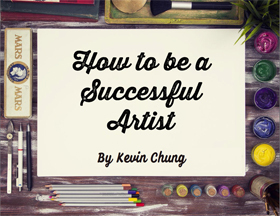 There is a stigma around being an artist. They think we “sit around all day and paint pretty pictures.” They think we will starve while trying to find success. There is no room for these thoughts. By asking questions, we create conversations. We make people think about themselves and their place in the world. Asking questions also opens people up to new possibilities. Books and movies are not only great entertainment, but they also shape our future. How much of the technology we have today was inspired by a great artist’s mind? Artists have the ability to change the world. We can change a person’s mind without saying a thing. It is time we show people what it means to be an artist. We must show people how our work inspires movements, how it can lift you up when you are down, how it asks questions about ourselves. The best way to ask better questions is by learning. Every time you learn something new, you should have more questions than answers. How does this information fit into your views? How can you reflect that in your art? Some artists choose to live in a bubble. They paint the same pictures. They do the same things. They stick to their guns. Don’t be that artist. Curiosity should be the lifeblood of an artist. What new ideas can you explore? Become curious and learn to ask why. We live in a world where you are constantly connected. We can spend our entire life staring at the screens in front of us, or we can explore the world. Exploring the world makes you question how much you know. So go see what the world has to offer. Children’s are born to deliver that’s why they stunned you spontaneous..